the colored boy: (grand)father time. Kinship. I've always thought it peculiar, that our ancestors' deed—the commendable ones—somehow become our own, attached to us. As if the triumphs of our grands and great grands are reflective of our individual capabilities while here on Earth. As if their power speaks directly to our potential. A pride assumed for the great-grandfather you never knew who supported his family with work as a tailor, a transgenerational high five for your grandmother's sister for whom a newly unearthed newspaper clipping points to a past life as an aerobic instructor and dance teacher, these things convincing you, somehow, of greatness residing within you, somewhere, likely obstructed by fear/uncertainty/stupidity. One of two Grandfathers I grew up with. Dad's Dad. This knowledge, I seek. Crave it. To know who up there was just like I am, who was also endlessly curious and rarely satisfied. To know of the challenges faced by those who birthed those before me, to be able to connect the dots of my family's murky past, being that masterfully, conveniently and routinely avoided gray areas outnumber plainly addressed black and white ones. "Hello. I am your grandfather. What's your name?" were the first words he spoke to me last night. This man, Lorhland Rall, gave life to the woman who gave life to me. A fog of a man up until this point. A man whose feats and failures had until now been offered to me in infrequent spoonfuls: sparingly, reluctantly. After prodding, always. Appeasingly. Never allowing me to experience him on my own. To form my own unbiased opinion. In Florida. On the way home from Disney World, in the very spontaneous and casual way you'd swing past 7-Eleven on the drive home from the gym after work. As if a roadside billboard reminded you that you needed eggs. The scene: otherworldly. Him, waiting and waving in the driveway in a t-shirt if Americanized or a white Guayabera if not too Americanized. I can't recall which. My sister, nieces, parents and cousin and I unloading from the rented white 12-passenger van to stand and fumble uncomfortably in the pristine and unused living room of this smiling Caribbean man only one of us had ever laid eyes on before but knew we were supposed to be excited to see. Dutifully shaking his hand, being stricken by his thick Caribbean accent, like my Grandmother's, and his white white teeth, yet feeling no connection. At the time, I still had the only maternal grandpa I'd ever needed or known, Grandpa Johnny, and saw no need for this bright-teethed man before me whose existence I was only made aware of moments prior. "We're going to see my father," as we pulled out of the Hardee's parking lot and headed for the highway. "...We saw Grandpa Johnny a few days ago," from the backseat. This is how revelations happen in my family. Back standing in the just-for-show living room, the magnitude of the moment escaped me. The awkwardness did not. Mom shaking the hand of her stepmother, either in the same age group or younger, and me waving at his son, my uncle, a few years my junior. And just as quickly as we rolled in, we were back in the van heading north. I haven't had a grandfather in 15 years. 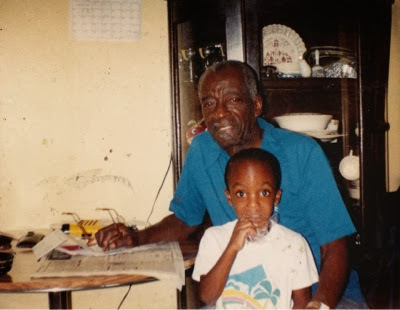 I haven't been able to rehearse the deference, adoration, and curiosity boys and girls feel for their parents' fathers since I was a teenager, when both grandfathers (Grandpa Cephus and Grandpa Johnny) died within years of each other. Haven't been able to crack open my wallet and pull out a story my grandfather told me. Or get tangled in the memory of a vignette from the 90s where I'm sitting on his unreasonably smooth bedspread, in front of a framed grayscale reminder of his younger version's military days, looking on in awe while this man performs some old man's activity like removing all of his dress shoes from their home in the closet to shine them all. I never had that with this guy. So, I'm cherishing this opportunity to create that memory, or some incarnation of it. I look forward to getting to know this man, however he decides to let me in. As I have researched my lineage these past few years and hit dead ends resulting from lacking public records and hushed, withholding relatives, I am reminded of the importance of valuing these older souls while they're here and able to tell these important stories, before those who gave birth to those who gave birth to me are reduced to a name and a set of dates, a too common tale. "Call me often," he chuckled. I wonder if he still has those white white teeth. "Call me whatever. Just as long you do." No, really. This is beautiful. I'm biased though. I think grandfathers are awesome. White teeth or not.